I sit in the sunshine today brimming with happiness. Life is so joyful right now for Team Mac. I am feeling great and we have had many happy moments over the past weeks. Will’s first lacrosse goal. Sharing McWane Science Center with Bennett (where I used to work in Alabama). Will’s first quail hunt. Bennett’s first soccer goal of the season. Family bike rides, family dinners with friends, building a chicken coop, March madness and datenights with my sweet husband. Life is good. As life goes for someone living with Metastatic Breast Cancer, tomorrow I have my quarterly PET scan. The anxiety of the scan is suffocating. And, I am overwhelmed with anxiety as I think back to how happy and carefree we were as this cancer was unknowingly taking over my body last year. I often feel like I don’t want to let my guard down and be happy… But, I AM! Is it ironic this scan is on April Fools Day? Hopefully cancer will be the fool and my scan will show stable disease and no progression. That is our sincere hope and prayer. I’d love to continue my dance with my new found friend NED (No Evidence of Disease). We appreciate all your thoughts, prayers, intentions and good juju tomorrow morning. Many ask how to support me as we live life to the fullest with Metastatic Breast Cancer. Here is how – I am training for the Kentucky Derby Festival Marathon. 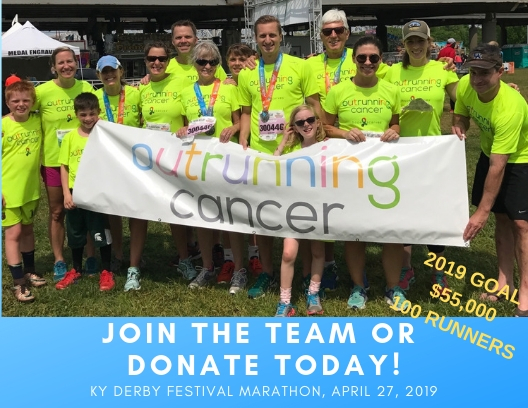 Running 13.1 miles on April 25th as part of our Hope Scarves’ team Outrunning Cancer. I would be honored for you to sponsor me in this run. The money we raise will support women facing cancer through our efforts at Hope Scarves as well as Metastatic Breast Cancer Research. I have run more races than I can count over the years, yet this one carries a significance like no other. I am so happy to be able to run and empowered to know each step I take will be making a difference. 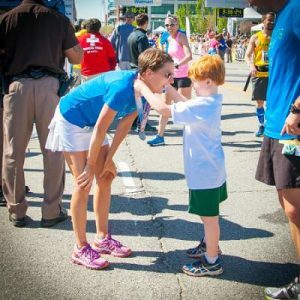 I would be honored to have your support as I outrun cancer. Simply CLICK HERE to make a donation on my fundraising page. Each donation – no matter how small or big is greatly appreciated. I will post the results of my PET scan when we know them tomorrow. Then, hopefully I will go for a run. I AM outrunning cancer not to run away from it, but to run faster and stronger than it. I don’t know how long this race is, what the terrain involves or what obstacles lie in my path. But, I will run strong and brave and hopeful! And hopefully someday we will run right into a cure. Thank you for your support tomorrow morning as I face this scan. And thank you for considering sponsoring me as I outrun cancer and live life to the fullest one mile and day at a time. I have been really sick for the past week. It’s “just a nasty virus” like so many others are dealing with right now. Not cancer!!! I repeat, Not cancer. But, as I fell into the sick stupor of this cold I also fell into a pretty dark hole of sadness. As I reflect on the past week I am a little overwhelmed with how closely my emotions and physical well being are intertwined. And I wanted to share that on this journey it isn’t just the scans and treatments that overwhelm us… it is our emotions as well. Let’s start at the beginning…. I spent March 5-9th in Houston at the Young Survival Coalition Conference for Young Women affected by Breast Cancer. It was an amazing experience. The Hope Scarves’ table was buzzing in the expo all weekend. We collected 127 stories of encouragement from young women – dramatically enhancing our story collection. Each time I shared our mission with an attendee it bolstered my commitment to our organization and our mission. Women were so excited to get involved and loved the work we were doing. I have an entire blog post to tell you more about this meaningful experience (stay tuned!) After talking non-stop for 3 days with heightened emotions my body was exhausted as I flew home to Louisville. As the wheels touched down my aching body slowly unwound and I felt the fatigue take over. I woke up Tuesday morning with an awful cold and could barely lift my throbbing head off the pillow. I spent the rainy day in my cozy bed reflecting on the conference, reading and sleeping. As I lay there and got more and more sick my thoughts spiraled to sadness and fear of a time when I will be this sick from cancer. Tethering through time I was transformed back to this time last year when my depression, fear and anxiety paralyzed me from every day activity. Then, in the same thought I spun to the future and I could see myself lying in bed overcome with weakness from chemo treatment. As I lay helplessly in bed coughing and feverish my mind and heart filled more and more with the fear and anxiety of being sick. I knew this was just a stupid cold, but lying there coughing and weak unable to help my kids with homework, listening to Jay take charge and be Mr. Mom, my mind raced to the fears of when this will be my reality. When I won’t be the person I want to be because of… cancer… When I won’t be here at all. I’m sure it seems strange to someone looking at this reality from a healthy perspective. How silly to generalize something so extreme. I should be happy and thankful for a cold – for normal, everyday illness. And, I kept telling myself that too. But, it didn’t stop me from being overwhelmed. It didn’t stop the anxiety from taking over. So, as I quarantined myself in my house for the past week- keeping my distance from kids and friends. I fell deeper into the fears and sadness that I can usually avoid. It sounds so cliche’, but this experience really is a roller coaster. Some days I feel so “normal” I even forget I have stage IV cancer. Other days (like last week) I lay in bed for days paralyzed by fear. With each dip and turn of the “ride” I hold on as tight as I can to the life I love. I am feeling a little better now – as far as the virus- and as a result my mental stability is coming back as well. I just thought I would share how with this disease even normal, every day events like a cold are bigger and more deeply felt for me and others facing stage IV cancer. The fears are right below the surface. I surprised myself how quickly I slipped back into depression and fear. I worked so hard to build up resolve to “live well with stage Iv cancer.” It scared me to think how I will react when I actually have to deal with progression and more cancer. How fragile I am, even though I am so happy. I have my monthly injection on Friday and a PET scan coming up in the next couple weeks. I’m washing my hands and drinking lots of water as I fight off this virus and climb out of the sadness of last week. I wish I wasn’t so overwhelmed and that I didn’t live in fear. I wish I had a better handle on all of this… but I don’t and that’s ok. This is who I am and how I live. Day to day. scan to scan. fear to fear. joy to joy. 1. How did you become connected with Hope Scarves? I actually first heard of Hope Scarves at the onset, when Lara MacGregor gave a talk regarding her newly founded organization at the kick-off dinner for the Race for the Cure, several years ago at the Jeffersonville waterfront. At that time I donated a scarf. Recently, I was able to actually meet Lara at The Village Anchor, and that meeting brought me full circle to her mission of bringing Hope to those facing cancer. 2. If you received a scarf and story please share how this impacted your healing journey. If you shared a scarf with a loved one please share this experience and what it meant to you. After meeting Lara, and sharing our stories briefly, it meant the world to me that she herself sent ME a scarf! A gift of Hope! That week, I learned of a friend from kindergarten through high school, that was just diagnosed. Of course, I wanted to pass on that Hope, & so I sent her a scarf. They give a feeling of joy,and comfort upon receiving them! They convey “I am here for you, I am thinking of you!”. I really believe I have a lot of inner strength. I was diagnosed 10 years ago with stage IV breast cancer, and there was NO WAY that I was going to give up! My family, and goals for the future, provided the WANT to keep going each and every day. I am currently ten and a half years from initial diagnosis. My journey has most recently become more difficult, as my doctor tries to find a treatment that will stop the progression of disease. I have gone through 4 treatments that have not worked, and currently am receiving a fifth, a new chemotherapy, with hope that this one is working. I am thankful for each & every day, and try my best to enjoy what that day brings, whether it be time with my daughters or granddaughters, lunch with a friend or my mother, or peaceful time at home with my husband. Living MUST outshine the cancer diagnosis! 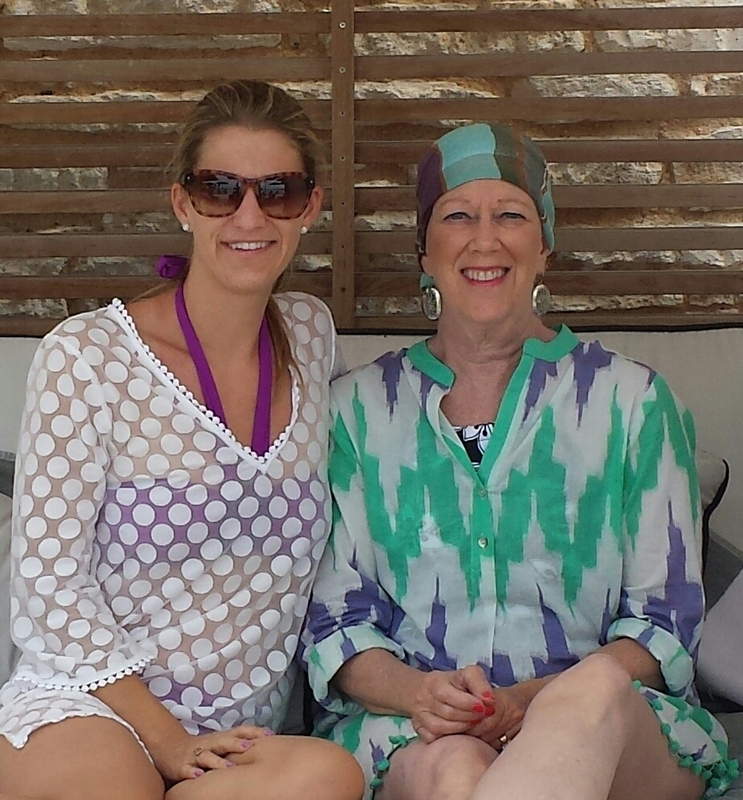 Hope Scarves is a mission of bringing Hope to ALL types of cancer patients. As the mission has grown, I believe anyone experiencing cancer, has most certainly heard of Hope Scarves. Amazingly, Hope Scarves has reached patients young & old, from the United States & beyond! Continue to pass the HOPE! 6. What would you tell someone who is thinking about sending a Hope Scarf to a friend facing cancer? If you have a friend or family member diagnosed with cancer, by all means, send a gift of HOPE…a Hope Scarf! I have been very fortunate to realize some of my initial goals….seeing a second daughter get married, having grandchildren. I don’t have a “bucket list”! I just keep planning events “down the road” with my family, and plan on being here to enjoy them all. After all, I am not in control, so I just continue living! My daughters may say “best Mom”. We are very close! My friends may say I’m the ringleader YOURURL.com. Seems I’m the one that organizes activities etc. My Mom, who is 91, says I’m the glue that holds the family together! 10. Please share something you learned facing cancer. I am still going through cancer, and always will be. As a good friend says, it’s like a bad part time job. Cancer takes a lot of time, but one has to strive to NOT let it become life’s focal point. There is too much joy in each day, to let cancer take over.